SAGE is an international, leading publisher of groundbreaking textbooks, highly influential journals, must-have reference materials, and innovative resources in education and educational research. Our offerings span the curriculum, featuring quality content and solutions that go beyond the classroom to ensure that present and future educators have the tools they need to succeed in today’s educational arena. Our goal is to make it easier for educators to serve their students better. Need K – 12 professional learning options? Visit Corwin.com for more information. An ideal introductory text for aspiring teachers, Introduction to Teaching: Making a Difference in Student Learning is grounded in the realities and complexities found in today’s schools. 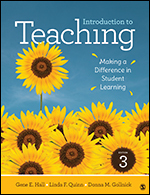 Acclaimed authors Gene E. Hall, Linda F. Quinn, and Donna M. Gollnick thoroughly prepare students to make a difference as teachers, presenting firsthand stories and evidence-based practices while offering a student-centered approach to learning. 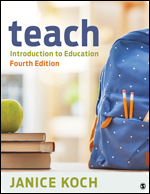 Teach is a concise introduction to education that challenges students’ preconceived notions of teaching in order to transform them into reflective practitioners. Empathizing with the difficulties students face as they move from the college classroom to their own classrooms, revered author Janice Koch invites readers to both reflect on their own dispositions for teaching and look outside of themselves to the demands of the profession, making the philosophy of teaching and learning accessible and relevant. 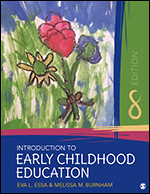 Introduction to Early Childhood Education provides current and future educators with a highly readable, comprehensive overview of the field. The underlying philosophy of the book is that early childhood educators’ most important task is to provide a program that is sensitive to and supports the development of young children. Author Eva L. Essa and new co-author Melissa Burnham provide valuable insight by strategically dividing the book into six sections that answer the “What, Who, Why, Where, and How” of early childhood education. Utilizing both NAEYC (National Association for the Education of Young Children) and DAP (Developmentally Appropriate Practice) standards, this supportive text provides students with the skills, theories, and best practices needed to succeed and thrive as early childhood educators.